in 8 Jawahar Navodaya Vidyalayas. Candidates who are qualified B.SC Nursing or GNM Course and having two or experience they are eligible to apply online for this NVS Staff Nurse Jobs from 12-11-2017 to 13-12-2017. Application forms will be accepted through the Navodaya Vidyalaya Samiti NVS official websites of @www.nvshq.org or www.nvsnt2017.org. Selection for these NVS Staff Nurse jobs will be through Written test/exam only. For more information NVS Staff Nurse Jobs such as exam pattern, JNV wise vacancies and other details are given details. Candidate must have qualified Inter/10+2 with Diploma in GNM or B.SC Nursing. Must have registered with Nursing council of India and 2 years experience in Hospital or clinic is required. Must have working knowledge in Hindi or local language is required. Candidates age limits are for General/OBC candidates 18-35 years and for SC/ST candidates 18-40 years, for OBC candidates 18-38 years. Objective type test will be conducted on computer for this Staff Nurse jobs selection. Written exam will be conducted for 100 marks. Online test will be held for 100 marks. Total 100 questions will be given and each question having one mark. Exam duration is 2 hours 30 minutes. Objective type multiple choice written test will be conducted for 100 marks. Total 100 questions will be given and each question carries one mark. Exam duration is 150 minutes. Exam Application fee for staff nurse jobs is Rs.1000/- and no fee for SC/ST/PWD and Ex Serviceman. Interested candidates may apply online for this Jawahar Navodaya Vidyalayas vacancies online on or before 13-12-2017. Online applications will be accepted through official websites of www.nvshq.org or through www.nvsnt2017.org. 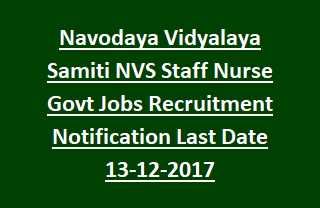 Apply Online here for Jawahar Navodaya Vidyalaya Samiti Staff Nurse Jobs.